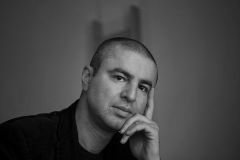 After studying in Skopje, he made a spectacular literary début in 1999 with his very first collection of poetry, »Zaklučeni vo gradot« (Eng. »Locked in the City«, 2009), which won the »Studentski zbor« prize. The same year he published a second collection of poetry »Nekade nikade« (tr: Somewhere Nowhere), winning the Aco-Karamanov prize. The anthology »Vo gradot, nekade« (tr: In the City, Somewhere) followed in 2004, and in 2007 he published the collection »Premesten kamen« (tr. Relocated Stone«), which received the prestigious Miladinov-Brothers Prize and the Hubert-Burda Prize for Literature. Already perceived as a beacon of Macedonian contemporary literature, today he is considered one of Europe’s most powerful voices. Madzirov’s poetry is striking in its lightness. It plays with everyday objects, deconstructing their self-evident meanings and associations in order to question established thought patterns and explore new sensual worlds. »In his verse a melancholy topography unfolds, of temporary, unstable identities whose memories, places and non-places never come together in a single story«, wrote the German author Uljana Wolf about Madzirov. »… and yet one also finds in Nikola Madzirov an avowal of continuity – it is the continuity of wandering names, of the mobility of language and history, the awareness that history belongs to many and that language also belongs to ›the other‹.« His works have been translated into 40 languages. German translations of his poetry have appeared in various literary journals, such as »Akzente«, »Wespennest«, »Manuskripte« and »Lichtungen«, among others. »What We Have Said Haunts Us« was published in 2016, together with 22 other contributions for the Hong Kong International Poetry Nights in 2015.